The April Amore – Hosting a Lovely Outdoor Party This Autumn. As the leaves turn brown and we transition from warm summer days into the golden hue of Autumn, there is no better time than now to host an outdoor party. With ideal temperatures for an outdoor get-together, it’s time to gather your friends and family and have a blast at an outdoor soiree. 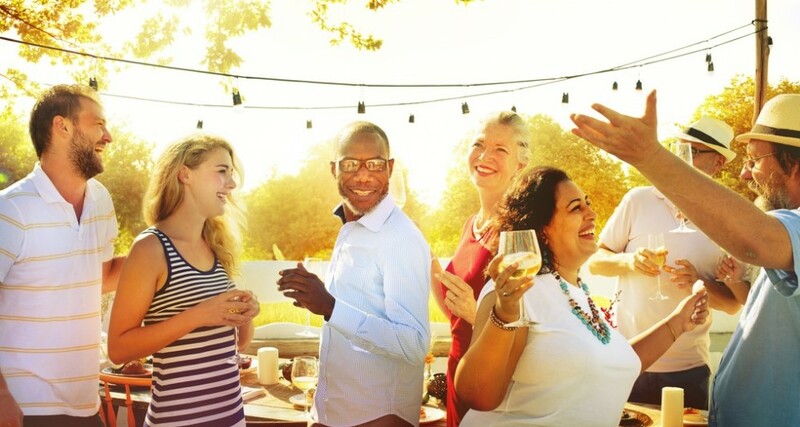 In this article, you’ll find some ingenious tips and tricks for hosting a lovely outdoor party this Autumn, so read on to find out more! One of the most important things when it comes to hosting an outdoor event is to ensure that your guests are shielded from the elements. One of the best ways to do so is to hire a marquee. Marquees are an essential addition to any outdoor party and will ensure that all your guests can enjoy themselves comfortably. Whether rain or shine, a marquee ensures that the show goes on. Marquees are available in a variety of shapes and sizes, ensuring that you’ll be able to find one regardless of how much outdoor space you have. Whether you’re hosting your event in your backyard or at a park, you can be sure that you’ll find a marquee to fit your needs perfectly! When hosting an outdoor event, it is essential that you serve outdoor friendly food. This means ensuring that food can withstand staying out of the refrigerator for a number of hours, so avoid too many items that contain perishable ingredients such as dairy or eggs. Some great dishes to serve up at an outdoor party are Bruschetta, Pigs In A Blanket, Scones, Sandwiches and anything that people will be able to pick up easily and pop into their mouths. If you are serving desserts, stick to cakes and treats that do not contain icing that could melt or go off under the sun. Don’t forget to provide disposable plates and cutlery that people can use as well. When it comes to the perfect drinks to serve, fruit punch or any other refreshing beverages are always a popular option. Autumn brings feelings of warmth and coziness to all, so when decorating for your party, stick to warm hues, cosy seating and keep things casual. Some fantastic colour schemes to adhere to are reds, dark oranges, browns, pine green and cranberry. When it comes to seating, you can always throw some cushions or throw blankets on benches or collapsible chairs. This won’t cost you a fortune but will add a whole new level of comfort to your outdoor party that your guests will truly appreciate. With the days running shorter as we approach winter, it is advisable to have some lights set up for when the sun starts to set. Fairy lights, lanterns and other whimsical additions will really add a touch of magic to your outdoor soiree whilst adding the practical element of being able to cover large areas of space with lighting. If you really want to up the romance and comfort factor, light some candles when it goes dark. Your guests will absolutely love it! Last but not least, why not make your guests feel special by offering little goodie bags or treats for them to take home? Door gifts don’t have to cost a fortune – something as simple as place cards with individual names and a few chocolates will leave your guests feeling like they’ve been to a fancy party. It’s the little things that count! We hope that this article has been useful in giving you some ideas on how you can host the best outdoor party this Autumn!